Whenever I am not well or feel lazy, TH becomes the cook of my kitchen. And, I know by default what he cooks. Egg, egg and only egg. I had never seen preparing recipes other than egg when I am not available. He usually says that the egg makes his job easier and reduces the time to stay in the kitchen. I find it correct anyway. It is always easy to prepare and helps when nothing available at home. 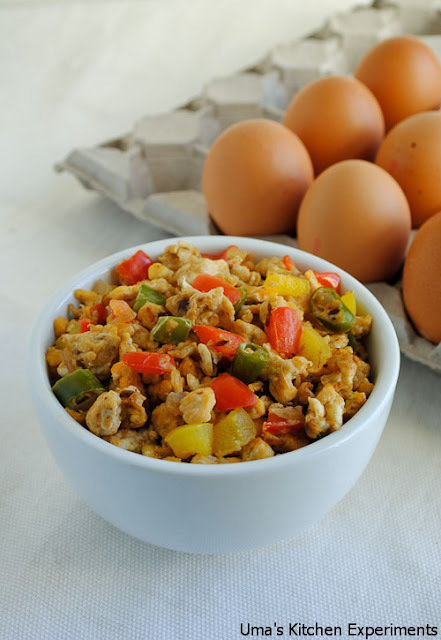 Here is the recipe from TH, the simple, easy, colourful egg bhurji. Enjoy!!! 1) Take a wok and heat oil in it. 2) When it is hot and not smoking, add mustard seeds and cumin seeds. Allow them to splutter. 3) When crackle sound of mustard seeds reduces, add green chillies. 4) Add onion and saute till it turns soft. 5) Add capsicum and saute without changing colour. 6) Break eggs one by one and leave it for a minute. 7) Start stirring continuously to form lumps. Initially it would look like messy as shown in the picture. 8) Stir it continuously till the eggs are not sticking with the pan. 9) Now, add salt and pepper as per the egg quantity and stir well. 10) Serve hot with steamed rice or chapati. 1) Roast and make a powder of cumin seeds and black pepper corns. Add this at the end of the preparation of egg bhurji. If you are doing this, skip adding the cumin seeds for the seasoning. 2) Addition of capsicum is completely optional. As TH and I like capsicum a lot, we added to this bhurji. 3) Avoid green chillies and increase the pepper quantity, if you are going to serve for kids. like this idea of adding bell pepper to bhurjee. looks amazing. I love eggs and include it almost daily in my diet. You have turned this humble protein into a really scrumptious dish. It looks very flavourful and delish. 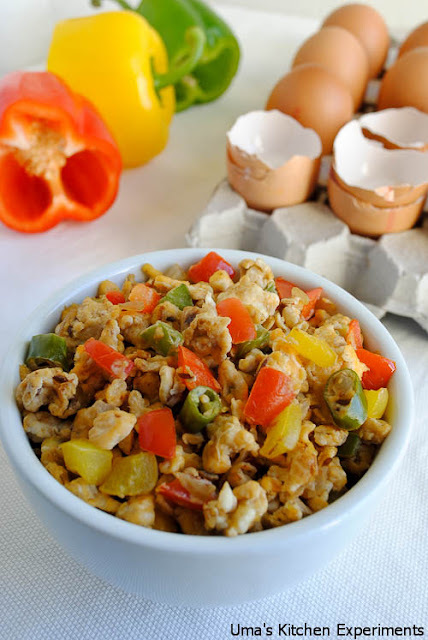 Simple n delicious one..I too have this in my draft since long,had tried the same combo as my kidoo doesn't like capsicum n he likes eggs,so 2-in 1 worked great!! hello, your have good collection of recipes in your blog.Glad to follow you.Do visit my new blog in your free time. Lovely blog.First time here.Glad to follow you. 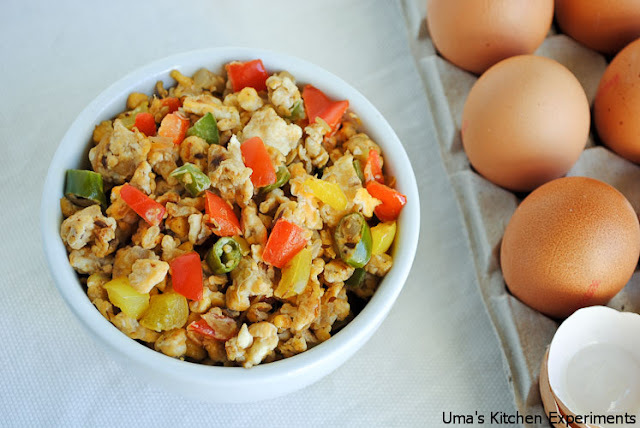 Love egg bhurji anytime and yours is so tempting. Would never even thought this dish had eggs! Looks so colorful!